As you must be aware that Aircel has filed for bankruptcy in India, which means that the company which run AIRCEL mobile network in India do not have any more funds to run the network any more. This is also evident by the fact that most of the Aircel users are facing network blackouts since 27th Feb 2018. Now there are few possibilities, one is, the NCLT will intervene and some other mobile network will take over aircel and the users will be given option to port or continue. Other possibility is aircel will send UPC to each and every users to port out. But in any of the scenario, it may take few days to many days time, during which the users will not able to use their mobile numbers which is a difficult situation for many. So the best solution for those who do not want to wait for the network to appear is PORT OUT of aircel manually to some other network. Porting is easy. 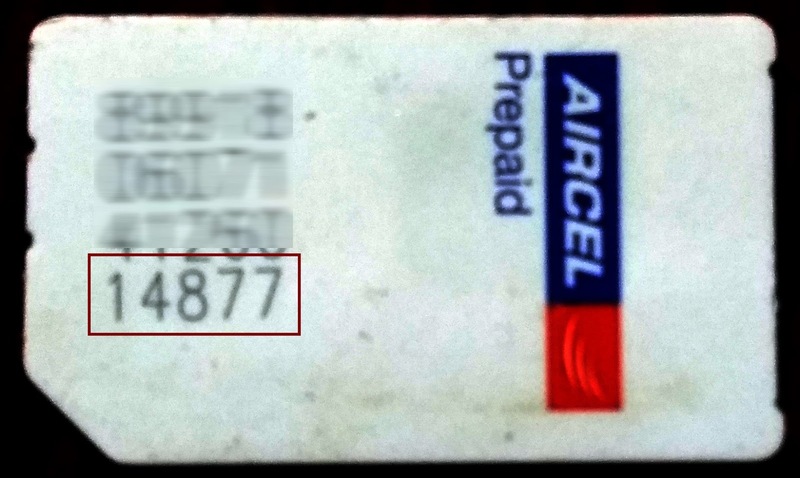 For that you need a Unique Porting Code (UPC) from aircel which can be used to port out to some other network. Normally UPC can be received by sending PORT to 1900. But at many places there is either no network available or if network available outgoing calls and sms are not connection. In such situation, it is not possible to send the PORT OUT request via SMS. If you are facing this situation, you can use the below method to get the UPC. How To Port Out From Aircel ? How To Get Porting Code To Port Out From Aircel. 1. Take our your SIM card and note down the last 5 digits of the SIM number. (As shown in the Image. 2. Now Call the AIRCEL Customer Care Number (for non aircel numbers) from Any Operator. To get the customer care number of your region visit AIRCEL Website and select your region. After that look at the bottom of web page and open Reach Us page. See the below image. I am also adding the customer care numbers below. 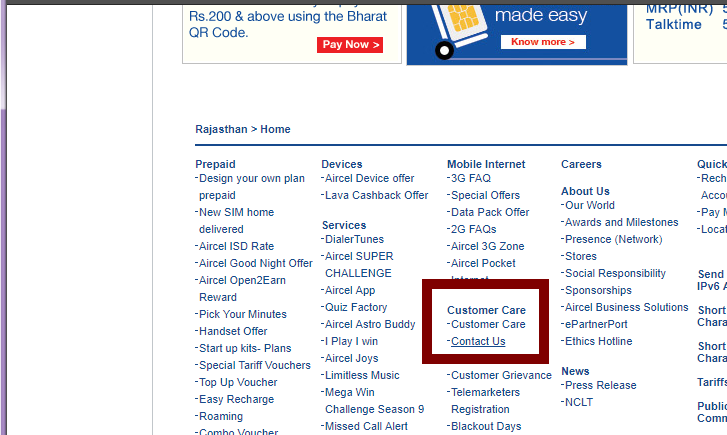 If the CC number does not work for you, you can use the aircel website. 3. Now follow the instructions on IVR phone. Choose language then enter Your Aircel Number. 4. It Will Ask to Put last 5 digits of your sim number. 5. Thats all!! You Will Get Unique Port Code (UPC) Without Aircel Network. If you face any problem, let us know in comment. India has seen tremendous growth in online marketplace. Online marketplace is rapidly growing, this in turn increased turnover of online payment. More and more people are moving towards online shopping mainly because of the convenience and various offers given by the online marketplaces. Government of India has also started a number of digital initiatives and encouraging people to pay various utility bills and fees online. Although online payments are safe and banks and payment processors take all standard necessary precautions for safe transactions. Banks are coming with more and more methods of online payments but still there is a risk of fraud while doing online transactions. It is the responsibility of the person who is doing online transaction to ensure complete safety of their bank accounts and debit and credit cards. Today in this post I will share a better and Secure method of doing online transactions which is more secure than using your regular debit or credit card for Internet banking. It is virtual debit cards of Virtual prepaid cards. Q. What is a Virtual card? Virtual debit card or prepaid cards are like a regular debit card with a debit card number, CVV code and date of expiry but it is not available in the physical plastic card form and is only available online from your mobile banking app or Internet banking account virtual debit cards. Q. What are the benefits of using Virtual Debit card? There are many benefits of virtual cards.. Virtual cards are free. There is no yearly or monthly subscription cost involved. The money added to the card can be easily controlled. 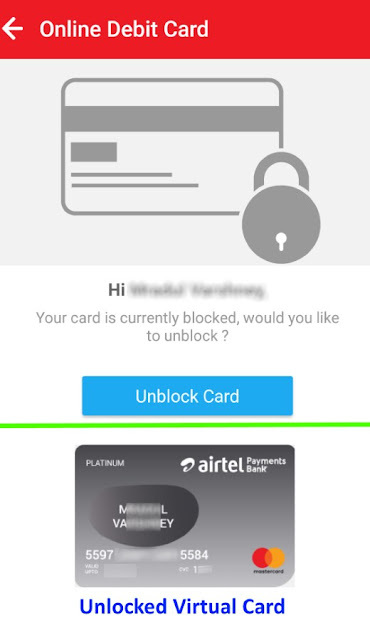 Virtual card can be locked or unlocked as per your need. You need not provide details of your debit or credit card to different websites and apps. A little detail about the benefits. The virtual cards are prepaid cards. Means that you will have to add the money via your debit/credit card or net banking to the virtual card, which can then be used to do online shopping. 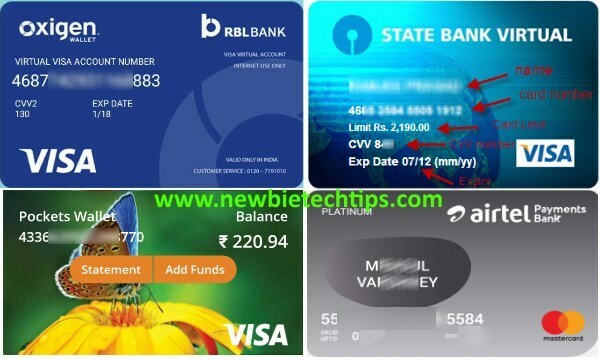 Most of our salary account linked cards or our main credit cards have transaction limits in lacks, so if we use our primary cards online we expose whole or our bank balance or credit limit at risk, but in case of virtual cards, this risk can be easily limited to few thousand as per the need. Locking and Unlocking: This is one of the best feature available with most virtual cards. The card can be easily locked with one or two clicks within seconds after you finish the transaction. When you need to do transaction again, the card can be unlocked again with same ease. This way when you dont need the card, the card can be locked and no transaction can be done with the card while it is locked. This improves the security of your funds. Q. Which services provide virtual Card facility in India. Paytm - Rupay virtual card. Airtel Payment bank - Mastercard virtual card. Udio - Visa virtual card. Payzapp by HDFC bank - Visa VC. Pockets by ICICI - Visa VC. Few of the features may vary from one app to other. But virtual cards are much safer for online transactions. So start using one today. 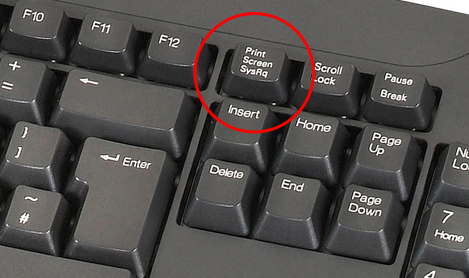 Taking screenshots in windows is easy and can be accomplished by clicking on PrtScr button on the key board. On clicking this button, the screenshot of whole screen is captured and saved to clipboard. The problem with this is, on most devices the screenshot is not automatically saved in any folder as a image. Although it is not a tedious task to save the screenshot in image format. But it still add 2 more steps. The steps to save the image manually is to open the image process app like Paint and paste the screenshot in that and then save it as image. If you take the screenshots frequently, may be because you are a tech blogger or you need to take screenshot for any other reason, then these 2 extra steps will also feel too much. So i am sharing a very easy small tip with which the screenshot can be saved automatically just with one click of PrtScr key. So lets see what is needed to do this.. Install a free official Microsoft onedrive app on your PC. This is a very easy requirement. If you do not already have the live.com account the follow these steps to register one free account. The account is free to create and use. With this you can enjoy, free Microsoft email at @outlook.com, 5GB free cloud storage and all other Microsoft services. Visit outlook.com and click on SIGN UP and enter the required detail to complete registration of your FREE outlook.com account. 2. Download and Install FREE OneDrive app. OndeDrive is a FREE 5GB cloud storage service of Microsoft. Download the installation file for windows and install the software. Login to onedrive software on your PC with your outlook.com account. A. 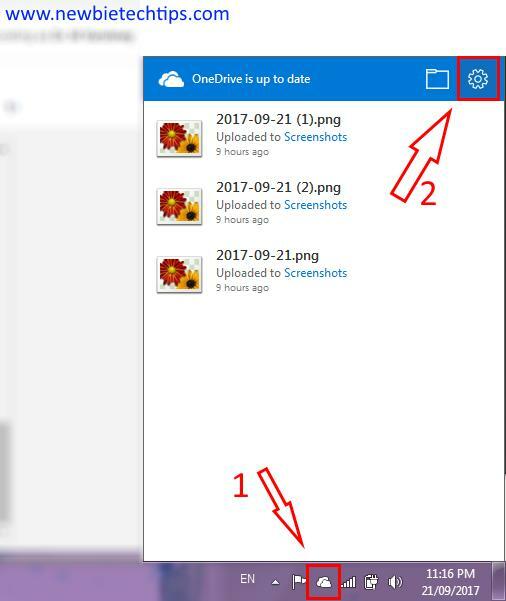 Open the settings page of OneDrive from the cloud icon on right side taskbar of windows and then clicking on settings icon. See the below image. B. In settings window click on 'AutoSave' tab. And in that activate 'ScreenShot Settings, which says "Automatically save the screenshots I capture to OnsDrive." Now whenever you click on PrtScn key on your keyboard, the screenshot will be automatically saved into your OneDrive folder. The screenshots are saves in ..path-to-Onedrive/Pictures/ScreenShots. The images are saved in .PNG format. If you use onedrive on other devices, like other PC, tablet or mobile the screenshots are readily available on all devices. 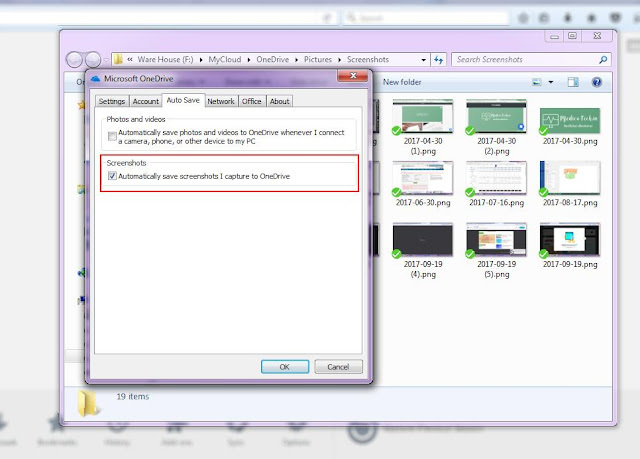 There is no need for a active internet connection for saving the images automatically but to access the screenshots on other devices, a active internet connection is required. 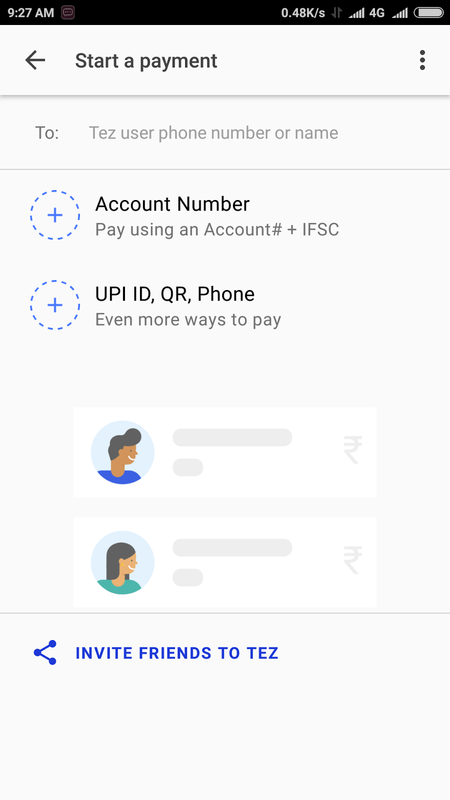 UPI or Unified Payments Interface launched by NPCI, quickly gaining pace in online payments in India. The main reason being it is instant and free. This resulted in many players like banks, flipkart, wallets etc started their UPI based app. 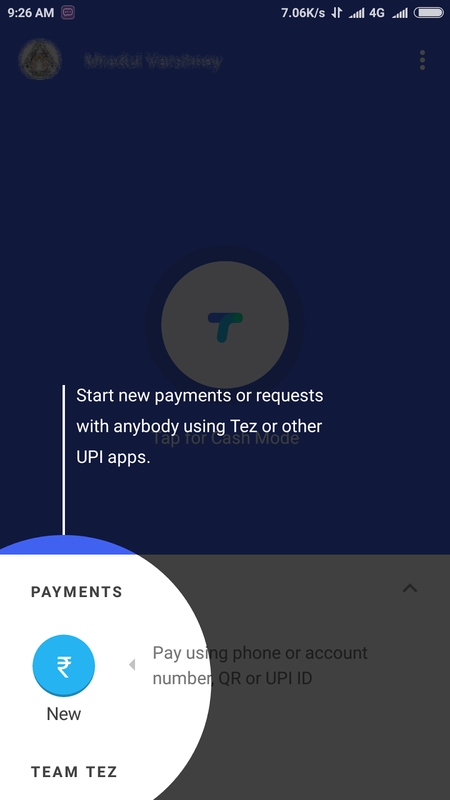 Next in line in the competition is Google's own UPI based payment app Tez. 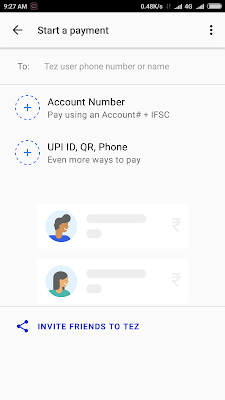 The app allows users to make the payments via UPI through 4 modes: through UPI ID, through bank account number+IFSC code, through scanning a QR code (bharat QR or UPI QR) and by using the phone number, the mobile number should be connected to a UPI enabled bank account. 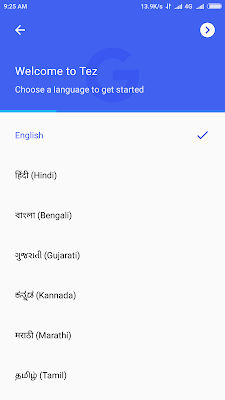 In addition to the three modes, Google has built another mode, which is especial to Tez. This is called "cash" mode and it uses proximity. The way Google describes it, the Cash mode will allow two users to exchange money if they have the phones in close proximity. Just tap the "Cash" button in the Tez app and then follow the instructions. The phone uses proximity sensor and microphone to enable payment and it, in a way, works similar to how users share Bluetooth files. Click here and install the app via official Play Store. 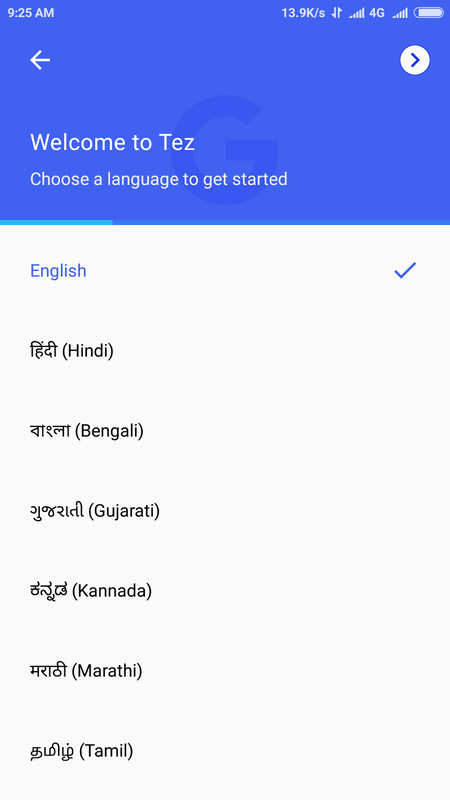 On opening the app for the first time, you will need to select the language and enter the Indian mobile number. 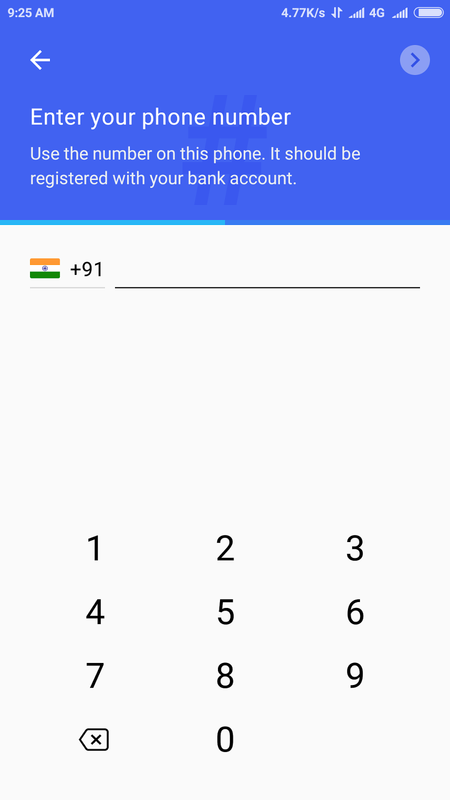 You have to make sure that the number must be linked to the bank account which you want to use with the app. The mobile number will be verified by OTP. On next screen you will need to select any one of the Google accounts available on the device to use with the app. Next step the user will be prompted to set the Google PIN or the pattern to secure the app from unauthorized access. 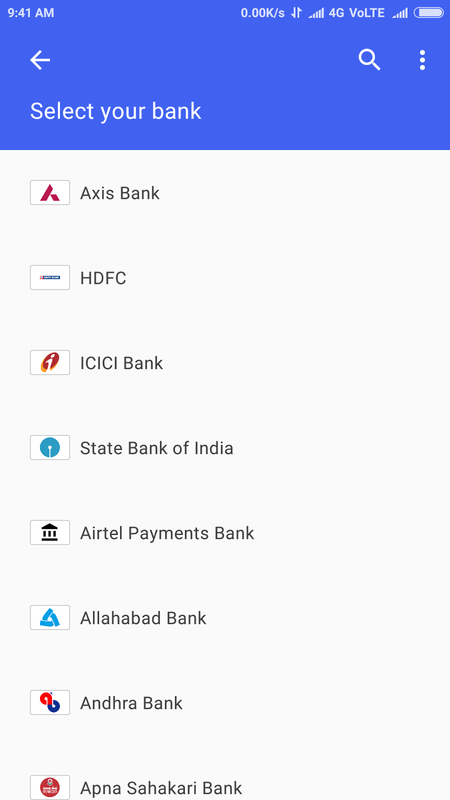 When user click on the payment button for the first time, he will be taken to the list of available banks with UPI facility. If the selected bank has already has a UPI PIN, the user will be prompted to enter the UPI PIN and if there is no UPI PIN associated with that particular bank account, user will need to set a new one. After finishing these steps, a UPI ID will be assigned. UPI ID in Tez is like name@okicici or name@okhdfcbank etc. 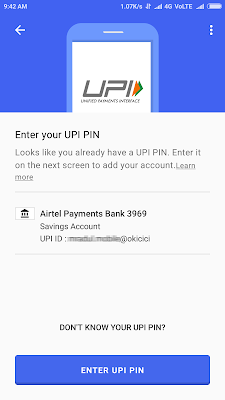 The UPI ID is automatically generated from the email ID used. 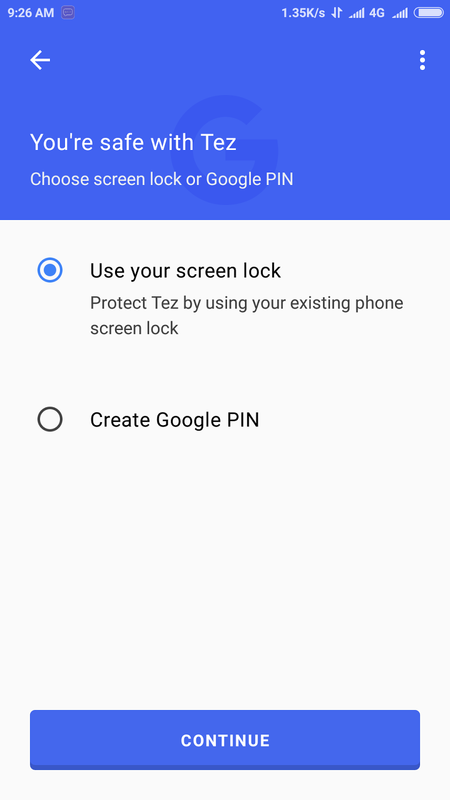 You can't use your existing VPA with Google Tez app if you have one. Currently Google has a offer on referring your friends to Tez. Both you and your friend will get Rs. 51 as the referral bonus. Tez is just launched and still in early stage of development. So it is normal to encounter some delay or bugs. We encountered server error in searching for the bank list once or twice while using the app on LTE network. We also expect many more features and offers as the development of the app progressses like recharge and bill pay facility, adding of existing VPA etc. Jio announced extended validity for plans, What about old recharges. Mukesh Ambani's Reliance Jio, the first all LTE mobile network of India has once again brought surprise for it's users with more freebies. After giving it's users free services under Welcome offer, Happy New Year offer and Summer surprise offer/Dan dana dan offer since Sep 2016, this time Jio has come with extended validity for it's existing recharges. These are the new extended validity for existing recharges. Now some of the users, who have recharged with Rs. 303 sequential recharges back in March 2017 are wondering weather they will also get benefits of this extended validity for their multiple recharges or not. Because if this extended validity is not applicable for those old recharges then it will be a great loss for the users specially for those who have done multiple recharges, because if they would have waited and recharged now, they would have got double the validity for same cost. In other words, this would be like PUNISHMENT for LOYALTY. Isn't it? 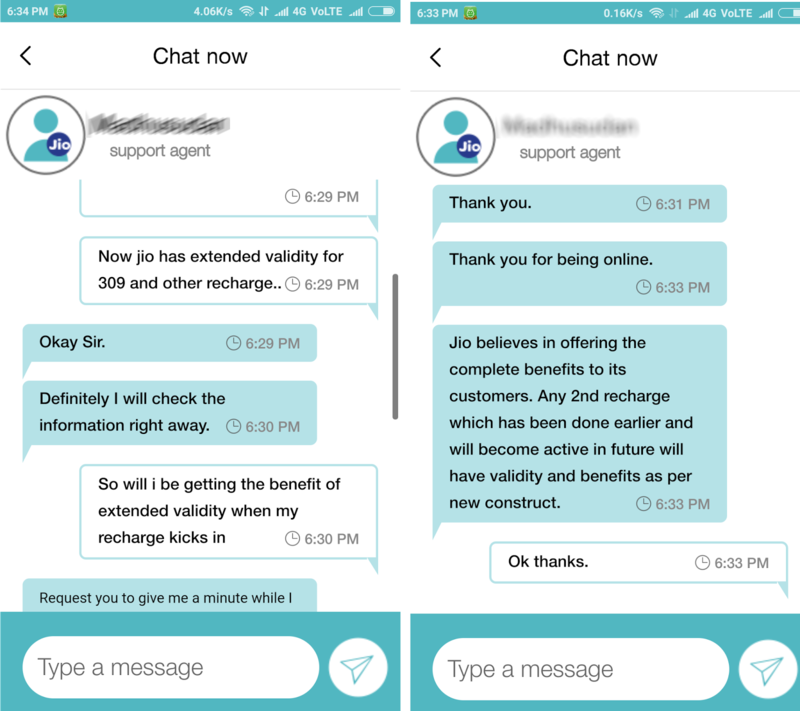 So to confirm this issue, we contacted Jio customer support and according to the it, the users with old recharges will most probably get the benefit of extended validity. 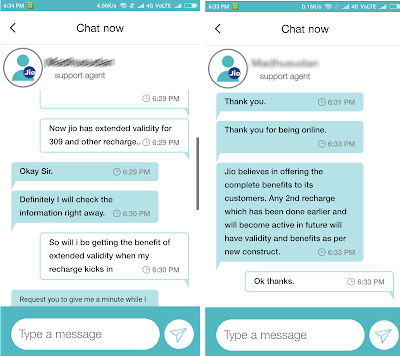 Have a look at the conversation we had with customer care of Jio. Note: This post is based on the response of the customer support executive of RJio. We cannot guarantee that everybody will get the above benefit. Reliance jio entered the telecommunication market with a blast. It's disruptive plans made all other Telecom operators reconsider their plans and packages and compelled them to reduce their cost to a large extent. On September 5th 2016 Mukesh Ambani LED jio info comm announced public launch of jio 4G network with Welcome Offer for ~3 months (till 31st Dec 2016), during welcome offer the users were given unlimited data (4gb per day cap), unlimited voice calls and unlimited sms. This unbelievable offer attracted around 50 million uses on its network within the span of just 3 months. which Jio claims to be the fastest growing tech company even faster than Facebook and Google. Initially the condition was such that people were standing in queues outside Reliance Digital stores to get hold of free jio SIM with welcome offer. In first week of December Mukesh Ambani announced a 3 month extension of free Reliance offer with the name of Happy New Year offer till 31st of March which includes free unlimited calls and SMS and 1 GB of data per day at high speed, to increase the user base to 100 million. The main question now is after the Happy new year offer, how many users will Jio be continuing with the service. It is human nature (and specially Indians) to try out anything if its free. The same is the case with Jio. Jio launched to public with everything free for more than 3 months, which attracted many customers to try it out. There were a lot of issues related to jio network in the beginning, but lets not forget, Jio services were new and some issues were expected to occur. But with all that, most customers of jio were not organic, and were there only there due to free offer. 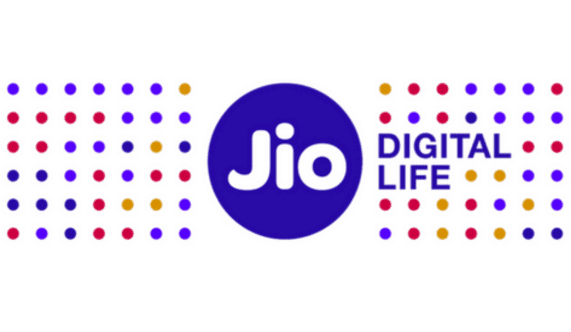 Even though many people, as many as 50 million started using Jio, but very few discarded their older connection and kept Jio as the secondary sim. This was mainly due to issues with the connectivity with other networks in the beginning. Now when Jio services will go paid after the completion of Happy New Year Offer, it will be the question that how many complementary customers will convert into paid customers. There will be many challenges in the way of this conversion from free to paid customers. Network Coverage This would be the most important and significant factor for people to adopt Jio as their primary number. Jio's 4G network is still available only in city areas. The coverage is not yet available in small towns and villages. A considerable share of Indian population lives in towns and villages or visit frequently to villages for business or other reasons. Due to non availability of network in these areas, many will not be able to adopt Jio as primary connection. True colors of 4G: Since the launch of Jio, all the users are waiting to experience true power of 4G. Jio has not yet shown its full potential. There has been regular glitches since the public announcement, whether its slow internet speed or call connection problem. The speed enthusiast might not be very happy with this, as high speed and cheap data is what attracted them towards Jio. 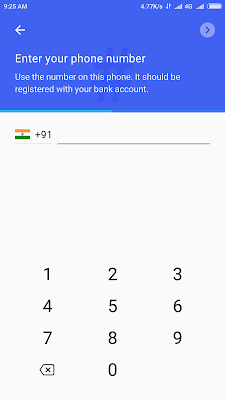 This is the second important factor, which may prevent users to adopt Jio as primary number. If the speed is not better than 3G of old established players and once the Jio start charging for it's services, only those users will switch who see some advantage of 4G over 3G. Competitive Plans from other telcos: To counter the effect of Jio promotional offer and to retain the customer other major telecoms operators have started special offers on data and calls. Due to the telecoms war, the data and call prices have come down by 150%. 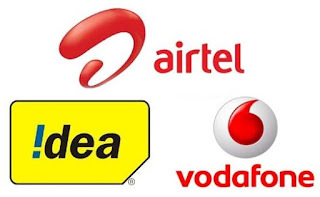 Now with major telcos like Airtel, Vodafone, there is a plan available for cheap data and calls. 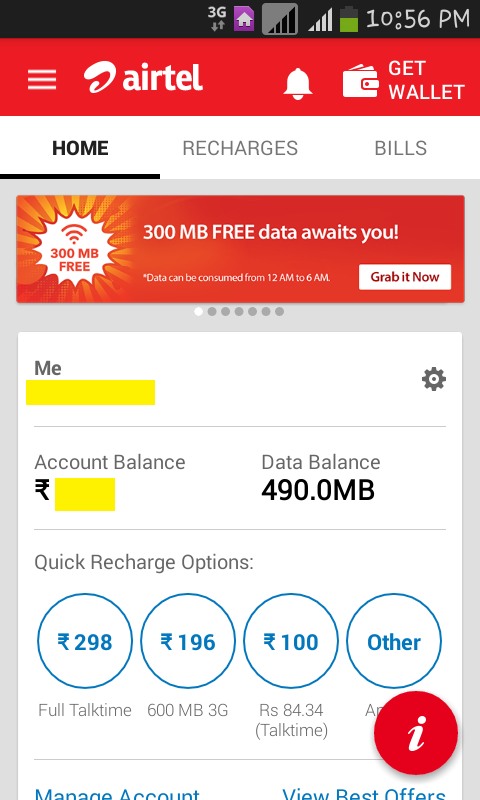 For example Rs 345 airtel offer with free calls and 3 GB of data for 28 days. Similar plans are available with Vodafone and Idea. With similar plans comparable to Jio and better coverage and connectivity, Jio will face a challenge to retain the customers after the service goes paid. VoLTE only network: Jio is the first all VoLTE network of India. VoLTE means Voice over Long-Term Evolution, which means the voice calls also use LTE network. This is different from other 4G network in a way that other networks like Airtel 4G etc. use 2G/3G for voice and 4G for data in their 4G circles. Being all LTE is not a bag thing in itself, it give better quality voice and video calls but this means that any user with a non VoLTE mobile cannot use any service of Jio. Majority of Indian mobile users still do not have a VoLTE enabled handsets, so to use Jio that will mean buying a new phone, this may be one of the factor many people will be hesitant to switch to Jio. Cost of VoLTE handsets: VoLTE is a entrant technology in India, and still most VoLTE handsets are above average cost. This may also play a factor, some people may not switch to Jio. So in summary, SIMILAR COST - BETTER COVERAGE - NO ADDED ADVANTAGE OF SPEED - TOTAL COST OF SWITCHING TO JIO will become real challenges in the way of Jio for retaining users after free offers finishes. 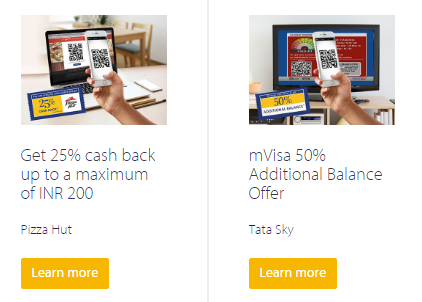 mVisa is a new online payment service powered by Visa (Company that powers Credit/Debit cards all over the world). This service is a purely mobile payment service in which the consumer will be able to make payments for various services and products like food, tickets, movies etc using the mVisa enabled app. The way it works is, the merchant will provide a QR code which can be scaned by the customer in his/her mVisa wallet app on mobile and the payment will be done instantly. 1. Bank of baroda CLIP mobile banking app - Any user can use this app. There is no compulsion of having a BOB bank account for this. This is kind of a online wallet service by BOB but the features are very limited. You will be issued a Visa Virtual Credit card, which can only be used for online payments. The card can be loaded by using any debit or credit card. 2. ICICI Pockets - This is a complete mobile payments app. Any user can apply. Similarly u will get a Virtual Visa credit card which can be top up by different cards and banks. 3. 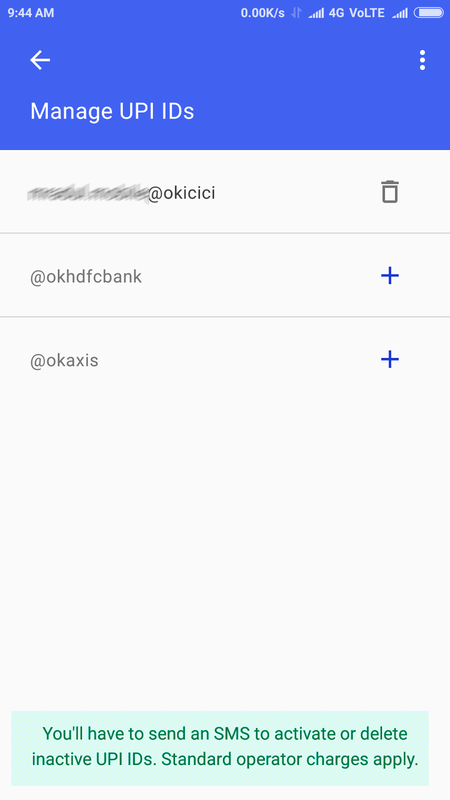 Axis Mobile app - This is net banking app for Axis Bank saving account holders only. In addition to different banking options, you can buy producs online and also using mVisa. 4. HDFC PayZapp app - This is also a full feature wallet which provide service of mVisa. 5. State Bank Anywhere - Mobile banking app of State Bank group. Can be used for mobile and shopping payment and also via mVisa. 1. Safety - your credit or debit card information will stay at one place and this virtual card can be used for all online transactions on internet. Some banks also issue physical cards to use in stores. 2. Convenience: Use sinle service to pay at all the outlets and utility bills. Its just like Mobile wallets. 3. Benefits: As a introductory offer Visa is giving great offers on product purchases. mVisa Merchant apps can be used by the merchants to create payment QR codes for the consumers to scan and pay. 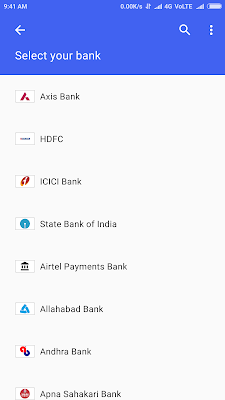 mVisa Merchant apps are available by State Bank Group on Google Play store. Note: Various bill payments and recharges on mVisa is only done via the virtual visa credit card which is generated in your account. However the card can be loaded with any number of Debit Credit cards or net banking. 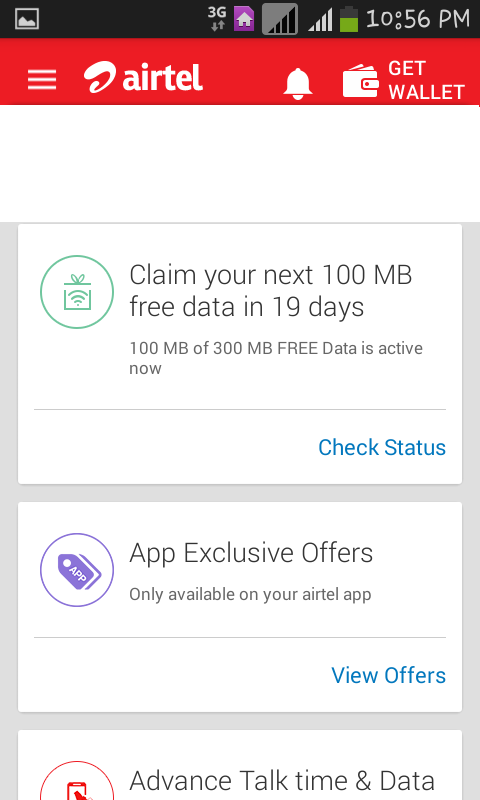 Good news for all airtel 3G users, airtel is giving out 300mb of free 3G data for all their My Airtel App users. This offer is available to all airtel users with My Airtel App installed on their smartphones. The data will be given in 3 installments of 100mb each month for 3 months. The data can be claimed from within the app. One downside is that this free data can only be used at night time between 12AM to 6AM. The validity of data is 8 days. 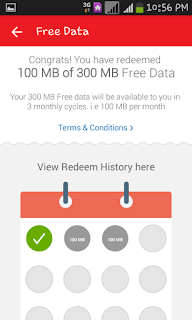 How to Claim free data. 1. Download latest My Airtel App from Here (direct Google Play Store link). 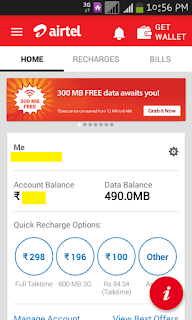 You can also download directly from Google play store by searching My Airtel App. 2. 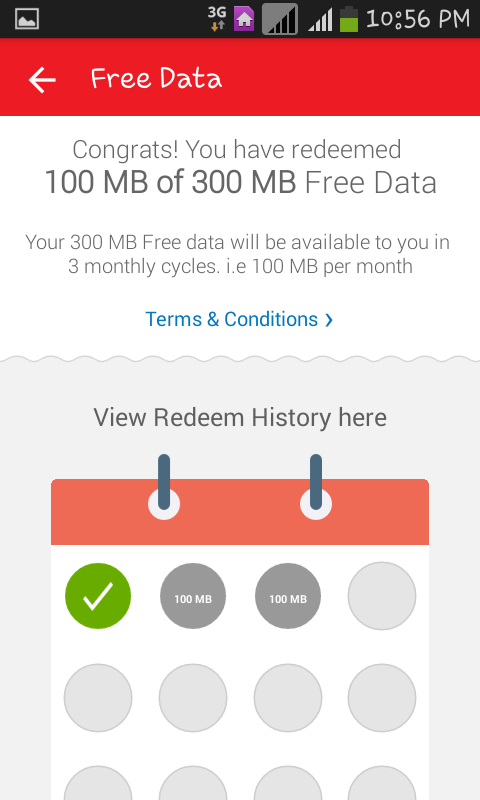 Open app and look for Claim your 300mb free data option, and click on it. Thats it. 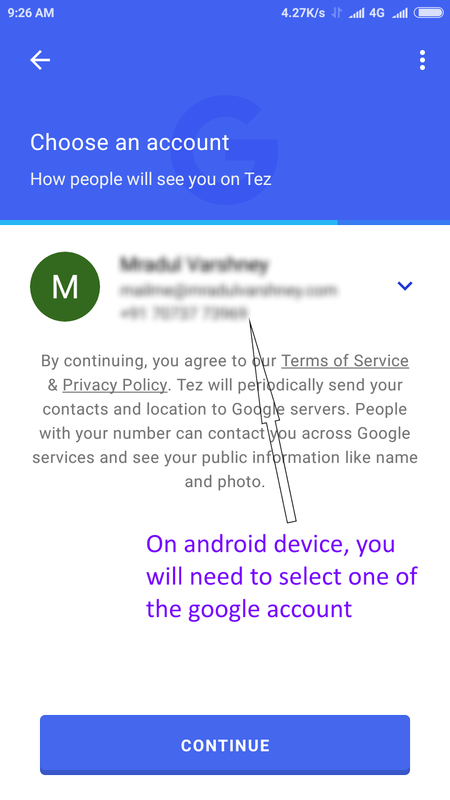 You will get sms notification for confirmation.